It is 1998, and Richard Stearns’s heart is breaking as he sits in a mud hut and listens to the story of an orphaned child in Rakai, Uganda. His journey to this place took more than a long flight from the United States to Africa. It took answering God’s call on his life, a call that hurtled him out of his corner office at Lenox—America’s finest tableware company—to this humble corner of Uganda. This is a story of how a corporate CEO faced his struggle to obey God, whatever the cost, and his passionate call for Christians to change the world by actively living out their faith. 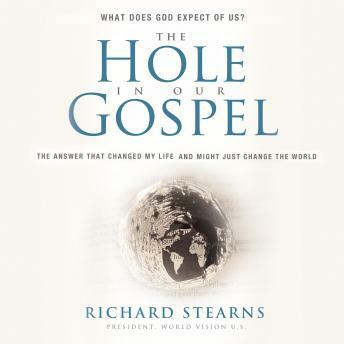 Using his journey as an example, Stearns explores the hole that exists in our understanding of the Gospel. Two thousand years ago twelve people changed the world. Stearns believes it can happen again. ECPA 2010 Christian Book of the Year Award Winner!